Arizona has a significant but relatively unknown legacy of photographs documenting its growth from the 1900 through statehood. The rise in the popularity of the post card paralleled a time of rapid and exciting growth in Arizona. Often, the only remains of the company camps and towns of the early 20th century are the photographic postcards that were sent to friends and investors, or slipped into an album as a reminder of a distant town and a life in the West. As Arizona continued its evolution to statehood during the period from 1900-1912, postcard cameras documented the events of the day. Territorial Fairs and small town parades, views of developing downtown business districts, railway accidents, mining activity, and images of daily activity were all available as photographic postcards to send to friends around the world. After statehood, photographic postcards were used to market and promote the state, and continued to document historic events like the Mexican Border War. Like stereographs twenty years before, virtually every Arizona photographer operating before 1920 offered photographic postcards. In addition, many drugstores, news stands, curio shops and hotels offered photographic postcards to their customers. Inexpensive cameras and photographic printing created a significant body of amateur documentation of the events that shaped daily life. As a result there are tens of thousands of Arizona postcards extent documenting a period of tremendous growth and development. During this time, from 1900 until about 1930, postcards served many of the functions of today's e-mail, telephone, and promotional videos. They were a common link between friends and family, vacationers and home, and even for business correspondence between traveling salesmen and their suppliers. High quality printed cards of photographic images further extended the market for postcards. Photographic postcards were avidly collected then and now. Since a majority of these cards depicted local photo images, postcards are a remarkable record of the towns, events, and life in early Arizona. 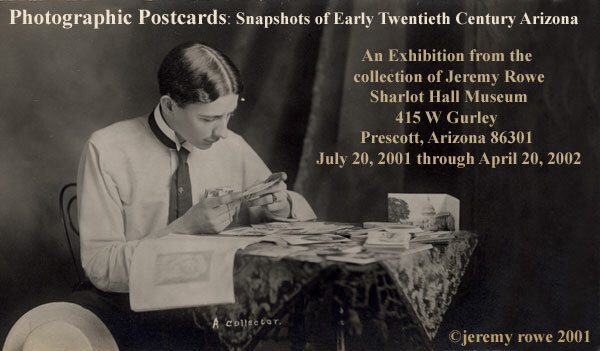 Guest curator and collector, Dr. Jeremy Rowe has worked with the Sharlot Hall Museum to create Photographic Postcards: Snapshots of Early Twentieth Century Arizona. This exhibit includes digital enlargements of about 90 images from some of the best Arizona real photographic postcards, related advertising and ephemera, and a selection of the cameras and equipment used to make them. Images and artifacts are from Dr. Rowe's collection and from the archives at Sharlot Hall Museum. Though no catalog is available, Dr. Rowe is completing a book on the Arizona photographic postcards that will include many images from the exhibit. The exhibit will run at the Sharlot Hall Museum July 20, 2001 through April 20, 2002. For hours or call 928-445-3122 or visit www.sharlot.org. For additional Information contact Jeremy Rowe at jrowe@vintagephoto.com or visit the vintagephoto.com web site.